There are a number of ways to achieve economic growth. Increases in productivity is one. Firms can invest in new capital, helping drive gains. The existing workforce can become better educated (including non-degree programs). Increases in the overall size of the economy is another. Population growth can pick up, helping to drive workforce increases and business sales with more consumers. Higher start-up rates increase the number of firms and innovation. Businesses can move to the area, due to clusters and/or recruitment efforts. Or, the local industrial mix can be beneficial with the sectors doing well having high concentrations locally. Our office has been exploring these various growth avenues to get a better handle on the state’s economy moving forward, and they are certainly not mutually exclusive. Mark and Kanhaiya will have more on population/migration next month, for example. What follows today, however, is a look at Oregon’s industrial structure and expected job growth over the next decade. The biggest takeaway is that the coming decade will be both a challenge and an opportunity for the Oregon economy. As touched on previously, two of Oregon’s economic pillars — the forest sector and hardware side of high-tech — are not expected to be job growth leaders in the years ahead. Now, to be sure, Oregon has numerous strengths, both from an industrial perspective and other aspects related to business costs, labor force, geographic location, and the like. However, much of our growth moving forward will come from industries in which Oregon has a somewhat smaller concentration. 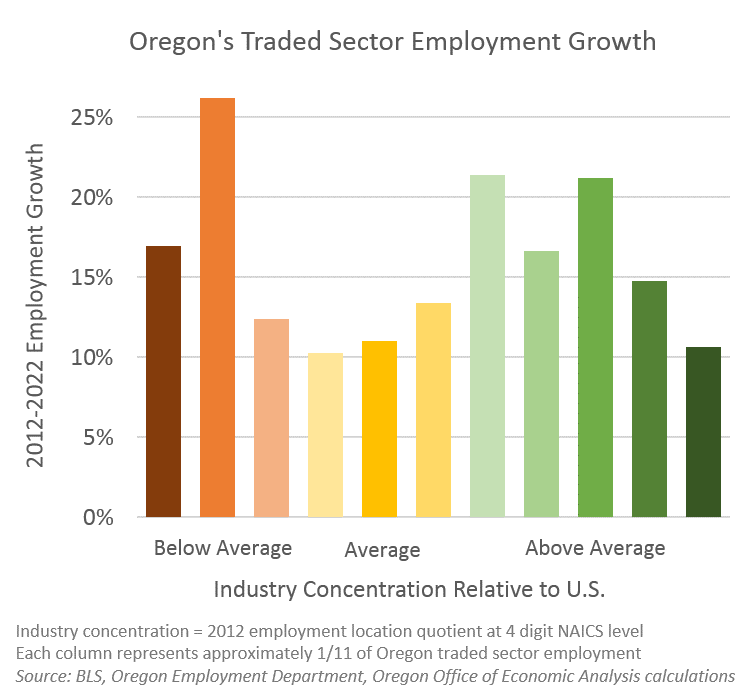 The graph below takes Oregon’s traded sector industries and compares the expected employment growth with the relative industry concentration in the state. The growth rates are taken from Oregon Employment Department’s 10 year projections . Given Oregon’s large manufacturing base (and traded sector more broadly) there are more green bars than orange bars because Oregon has more above average industries than the typical state. First, as stated above, Oregon’s strongest concentrations are in the forest sector and high-tech manufacturing. These industries (dark green) are expected to grow less quickly than many others moving forward. Since the data are for 2012-2022, from today’s employment, these industries are not expected to grow very much further as most of the growth has already been realized or will be this year or next. The good news are the other green bars. This does include some wood products, but much of the growth is driven by increases in management of companies, food and beverage manufacturing, published software along with gains in crop production and nurseries. It’s a bit of a mix but all of these industries in Oregon are at least 25 percent larger, in a relative sense, than they are nationwide. Many are much larger than that. It is certainly good news that many industries in which Oregon has a high concentration in are expected to do well and outperform other industries moving forward. This pattern of growth will provide a fundamental boost to Oregon’s growth. The real challenges and opportunities are coming in the orange bars. These industries, like consulting services, computer system design (custom software), financial investments, and scientific R&D, are expected to grow much faster than the typical industry. However, Oregon has a low concentration in these industries today. To the extent that we are behind the curve, so to speak, than the state may not fully realize these gains if they rely more on clusters and concentrations of similar firms that may already exist elsewhere in the country. With that being said, expectations are for these industries to grow quickly here as well, particularly the industries tied to high-tech. While Oregon’s historical strengths have been on the hardware, or manufacturing side of high-tech, the software side is currently driving growth and will likely do so moving forward. All told, it is somewhat of a mixed bag in terms of Oregon’s industrial structure and expected growth. Many industries in which Oregon has a relatively smaller concentration, will grow quickly in the future. Some of Oregon’s largest industries will grow less quickly. With that being said, there is lots of good news for the state’s economy, and the good news likely outweighs near-term concerns. However, keeping these facts and trends in mind is important. Furthermore, add on top of this the growth in consumer services (or the non-traded sector) which is tied a bit more to population growth, which is picking up as well. The employment growth is based on the Oregon Employment Department’s 10 year projections for 2012-2022 (PDF). OED uses our office’s forecast as a base, however they do modify the outlook based on a more detailed look at the 4 and 6 digit NAICS level. OED furthermore produces occupational projections at the regional level as well. Overall the industry projections, as used above, have the same general characteristics, or flavor, as our office’s baseline forecast, even as specifics do vary from industry to industry. Our office would like to thank OED for their help in providing their detailed data for our use. Our office would also like to thank Business Oregon for their discussion surrounding traded-sector industries. Another good growth – really development –strategy to remember should be on the list if early childhood education. It’s often overlooked, but is at least as affective as other strategies. See the work of James Heckman of the University of Chicago, or Timothy Bartik at the Upjohn Institute.